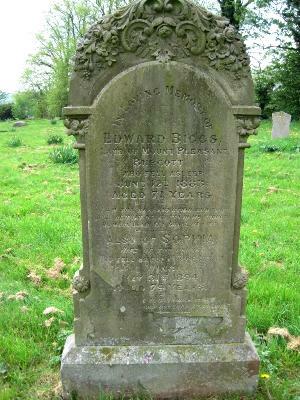 In loving memory of Edward BIGGS, late of Mount Pleasant Burcott, who fell asleep June 12th 1883 aged 71 years – I am the resurrection and the life. He that believeth in me though he were dead yet shall he live. – Also of Sophia, wife of the above, who fell asleep at Rose Cottage Wing, May 31st 1894, aged 79 years – [masonry damaged].